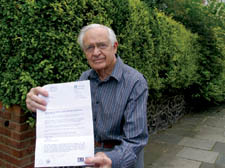 FOR years, campaigning pensioner Ken Savage has watched overgrown weeds from the council-owned home next door encroach on his garden with little attempt by the landlord to stop nature’s course. So when the Town Hall sent the 72-year-old a lawyer’s letter instructing him to clear up his own trees and bushes or face the consequences, he thought somebody might be playing a joke. Mr Savage, the Greater London Pensioners Association’s general secretary, was told he had to trim his hedge or risk legal proceedings under the Highways Act. There was no mention of the overhanging foliage from the next-door home in Howitt Road, Belsize Park, which the council has left empty for periods over the last two years. Mr Savage said: “They’ve got a bloody cheek. I spoke to someone at street environment about it and he said: ‘Well, next door will have got a letter too.’ I asked if he knew that was council property and obviously he didn’t. The council’s decision to leave the house empty for so long – at a time when 15,000 are waiting for council properties – has been a source of controversy. The home will be handed back to the original freeholder in the next few weeks after a 99-year lease expired. Work on repairing the property was only done in the run-up to the hand-over. A council press official said: “The property was tenanted until April this year, when the last tenant was moved out in readiness for the hand-back.